We have written extensively and critically about how stock exchanges have taken their customers’ data and used it to sell “edge” to the highest bidders. 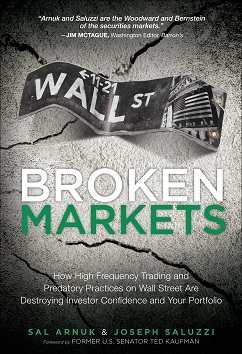 In fact one of the chapters (It’s the Data, Stupid) in our book Broken Markets was devoted to the topic. At a time subsequent to the stock exchanges becoming “for-profit” and going public, the exchanges stopped seeing themselves as efficient destinations for the fair secondary trading of corporate ownership – which aids in capital formation – and started seeing themselves as arms dealers. They make more money selling edge and catering to fast traders than they do matching trades. A purchaser of Single-Factor Analytic Bundles may, under certain circumstances, be able to reverse-engineer factor calculations to obtain transaction-specific information not otherwise available on the Exchange’s data feeds. For example, an investor observing a thinly-traded stock may be able to use the Single-Factor Analytic Bundle calculations to determine the type of customer (Customer, Professional Customer, Firm, Broker-Dealer, etc.) adding or removing liquidity—information not otherwise available on the Exchange’s data feeds, as noted above. Such information may be useful in identifying the investment strategies of particular customer categories. Should the SEC approve Nasdaq’s new product, it will signal to our markets that the SEC is increasingly ok with stock exchanges segmenting their clients into buckets, and selling information about them. They already do so by indentifying retail investors on their feeds. This kicks it up a notch. When such big investors want to buy or sell large quantities of options, their brokers will often break the order into chunks and execute them throughout the day. The idea is to avoid tipping off the market about the large investor’s intentions. There are those who will claim, including Nasdaq and some of thew traders they developed these products for, that the Intellicator promoted fairness. After all, in the old days, a broker on the phone could give market color about a client’s order (i.e. plain vanilla long-only big dog from Boston), which was not right, and the Intellicator makes it free and open for anyone (that will pay Nasdaq for the color). Nasdaq says in their filing, and in subsequent comments to the Wall Street Journal, that they are trying to “democratize the options market and level the playing field.” Make no mistake, what they are really doing is taking the bad market structure things from “the good old days” and making them systematic. We hope the SEC understands the ramifications of such rule filings. We hope they understand by now that their decisions set precedent. We hope they come around from their decade-long look-the-other-way means of regulating, and own that is the their job to make sure the public markets are here to serve investors first and foremost – and not traders and “intermediaries”.